Ensure proper operation of gages during periods of record. Completed elevation leveling checks at gaging stations according to USGS Techniques and Methods. Perform streamflow measurements throughout Indiana using both mechanical and acoustic instruments; incorporating OSW methods, in addition to performing streamflow measurements under ice cover in Northeast Indiana. Perform streamflow flood measurements during high-water events in Indiana. Collect routine NAWQA surface water nutrient and E. coli water quality samples, suspended sediment samples, chlorophyll, in addition to routine maintenance and calibration of multi-parameter water quality probes at multiple sites. Assist with various forms of sampling at Indiana Harbor Canal including routine nutrients, chlorophyll, toxics, microplastics, and passive sampler deployment and retrieval. Led National River and Stream Assessment biology crews with electrofishing sampling, aquatic habitat surveying, and benthic macro invertebrate sampling. Responsible for computation and checking surface water, groundwater, and water quality records at various Indiana sites for annual USGS data report. Continue to serve as project lead for Carp detector gages in Wabash and Huntington areas of Indiana. Continue to be a part of Ecosystems and Hydrologic Investigations committees for the Indiana-Kentucky commonwealth. Leading Edge of Field storm runoff study in the Fort Wayne, Indiana area with NRCS, Allen County SWCD, EPA, and GLRI as cooperators. Served as main contributor to Indiana-Kentucky commonwealth biology QA plan and biology specialist as specified by Scott Morlock. Trained new and lower-graded employees in regards to USGS OSW methods and emphasized Indiana hydrologic networks section policies. Led public outreach activities and lectures relating to surface and groundwater hydrology, water quality, and biology; ranging from cooperators and the general public to the university level. Organized Campbell Scientific programming training hosting for regional USGS attendees at Indianapolis office. Programming experience with Campbell CR1000 and CR1000 dataloggers. Familiar with calibration of YSI water quality monitors. Minor experience with Bio Data, ArcView GIS, R Studio and Minitab statistical software. Possess field experience with electrofishing techniques, Indiana fish species identification, Indiana and North Dakota stream habitat assessment, and water quality record computation for USGS annual report. Electrofishing certified by the United States Fish and Wildlife Service as of March, 2012 and possess biological specimen collection permit by the state of Indiana for 2014. Possess a Federal passport for international travel to Canada. Master of Science Thesis "Assessment of Water Quality Changes Resulting from Municipal Sewer Installation in the Killbuck-Mud Creek Watershed, Indiana." Assisted with data collection throughout the duration of the project and mentioned in the acknowledgements portion of Assessment of nutrients and suspended sediment conditions in and near the Agassiz National Wildlife Refuge, Northwest Minnesota, 2008-2010. 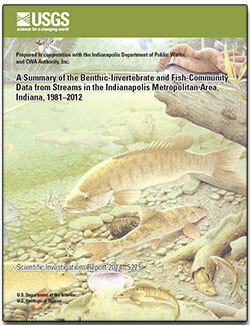 Assisted with data collection and listed as co-author of A summary of the benthic-invertebrate and fish-community data from streams in the Indianapolis metropolitan area, Indiana, 1981-2012. Inspected surface water and groundwater gages, performed minor repairs at assigned sites, assisted with construction and installation of streamgages along with associated electronic equipment, and ensured proper operation of gages during periods of record. Assisted in performing elevation leveling checks at gaging stations according to USGS Techniques and Methods. Performed streamflow measurements throughout Indiana using both mechanical and acoustic instruments; incorporating OSW methods, in addition to performing streamflow measurements under ice at Northeast Indiana sites. Performed streamflow flooding measurements in North Dakota, Minnesota, and Indiana during high-water and flood conditions. Assisted with collecting routine NAWQA surface water nutrient and E. coli water quality samples, suspended sediment samples, chlorophyll, in addition to maintenance and calibration of multi-parameter water quality probes at multiple sites. Responsible for computation and checking surface water, groundwater, and water quality records at various Indiana sites for annual USGS data report. Assisted with electrofishing sampling, QHEI aquatic habitat surveying, and benthic macro invertebrate sampling. Trained new and lower-graded employees in regards to USGS OSW methods and emphasized Indiana hydrologic networks section policies. Performed public outreach activities and lectures relating to surface and groundwater hydrology, water quality, and biology; ranging from grade school to the university level. Assisted with USGS booth display for National Science Teachers Conference in Indianapolis, Indiana along with INWSC Director. Performed surface water ice, wading, and bridge discharge measurements at real-time streamgage sites in addition to crest-stage non-recording gages. Familiar with using velocimeters including acoustic Flowtracker, mechanical AA and pygmy meters in accordance with USGS OSW procedures during open water and under ice conditions. Collected groundwater stage data using various dataloggers, along with electronic and graduated steel-tape methods. Familiar with electronic and optical methods of obtaining station levels to determine reference point elevations. Collected low-flow, high-flow water quality samples, and suspended sediment samples in Minnesota and North Dakota using various methods. Collected water quality samples for several USGS suspended sediment loading projects in Minnesota and North Dakota. Assisted other technicians and hydrologists in various duties ranging from gage construction, completion of routine site visits, and assisting with acoustic streamflow measurements during various conditions. Assisted studies hydrologists with EMAP biomonitoring and aquatic habitat analysis in Western North Dakota.